It has been quite some time since I’ve written an article in this series. The purpose of the D&Development posts is to discuss some of the biggest influences on me as a Dungeon Master from the earliest days of my time playing D&D. Previously, I’ve looked at favorite settings, books, the animated show, and even non-D&D novels. (You can find a list of the previous articles by clicking on the D&Development header above.) Today, I wanted to bestow some praise on the Gazetteer series of accessories, detailing the world of Mystara. During my junior high years, unlike many of my friends and fellow players, who preferred AD&D, Basic D&D always had a soft spot in my heart. It wasn’t until 2nd edition that I really made the transition. As a result, in 1988 and 1989, when I was moving from junior high to high school, I was still entrenched in Basic through and through. As rich as the boxed sets and Basic adventures were, I was perfectly happy reading them and using them in my games. I did envy the greater options available for classes, spells, and skills from AD&D, however. The Gazetteer series came along, and went a long way towards filling in the blanks of Basic compared to it’s Advanced sibling. Several new classes, particularly for non-human characters, became “official” with no house-ruling required. A system for skills was presented throughout the series, adding even more options for characters. Like any good supplement, the Gazetteers included many new spells, as well. From a rules perspective alone, the Gazetteers were amazing, and gave Basic a depth that, by this point in my DMing career, I craved. But there was far more to the series than just “crunch”. The “fluff” was amazing, too. I spent hours and hours reading about all the different locations, people, and cultures across the default D&D world, which I now knew was called Mystara. The Grand Duchy of Karameikos, the first GAZ I ever picked up, gave details about the world that were only hinted at in the Expert set and other adventures. I set many of my adventures in the town of Threshold, which was obviously a pretty good home base for players to adventure out of. It was a fairly standard fantasy setting, but I didn’t see any problem with that at the time, and still don’t today, preferring to set my 4E campaign in the Nentir Vale. The Grand Duchy of Karameikos, great as it was, wasn’t enough, so I picked up other Gazetteers when I could. The supplements dedicated to non-human races truly hooked me on the series. The Elves of Alfheim, the Dwarves of Rockhome, the halflings in The Five Shires, and especially The Shadow Elves were incredible. The cultures were at once fantastic and yet still believeable, and went a long way towards distinguishing between one elf or dwarf from the next, which was difficult with the whole “race as class” issue in Basic. I remember reading The Crystal Shard, and thinking how odd it was that Drizzt was dark-skinned, instead of light, like true underground elves were. I realize now how backwards that really is; the shadow elves were the imitation of drow, not vice versa. In any event, I read and reread these Gazetteers time and time again. Perhaps the highlight of the series was GAZ10: The Orcs of Thar. Far more than what you might think from the title, this Gazetteer included rules for PCs of all the major humanoid monster races. Yes, you could finally run a campaign with a kobold, a goblin, an orc, and a troll as unique playable races. It was hilarious fun. The inclusion of the game Orc Wars was just gravy. I know PC dragons, a la the memorable Council of Wyrms boxed set, might be more epic, but it couldn’t have been more fun than humanoid PCs. Think the A-Team, but with bad grammar and bloodlust, and you’ll have a good idea of how much fun a monster campaign can be. The remainder of the Gazetteer series was solid, though not as memorable as those I’ve already mentioned. Most of these books were basically D&D interpretations of real-life cultures, ranging from Vikings and Native Americans to the Greeks and Romans. It may seem at first glance that this practice was like putting a square peg in a round hole. In my experience as a novice, I found the material to be easier to assimilate into my memory because of the real world associations. It’s far easier to remember that Ylaruam was like the Middle East than it is to remember all the different factions in Waterdeep, for example. I’m not sure if this ease of use was the intent or not, but it made the Gazetteers very useful for me either way. Overall, I have many fond memories of the Gazetteer supplements, and remember using them so much they were practically falling apart. All of the extra classes, skills, and spells added much-needed depth to Basic D&D, and the lore and other background information was extremely useful in my early campaigns. It was also fun to simply read through, whether I used it or not. 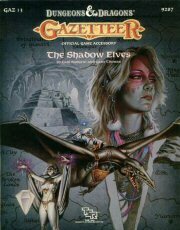 I’m hopeful that the Gazetteers will be released digitally at dndclassics.com soon. If they are, I will enjoy rereading them, reliving the memories of my youth, and perhaps even running one more monster PC mini-campaign again someday!